I can count the days until summer draws to a close and autumn seeps into the leaves, painting them ginger and scarlet. Right now, though the dappled light of mid-afternoon is glorious emerald, and it's hot on my face. With sun soaking into me, everything is possible. "Incapable. Awkward. Artless. That’s what the other girls whisper behind her back. But sixteen-year-old Adelice Lewys has a secret: She wants to fail. Gifted with the ability to weave time with matter, she’s exactly what the Guild is looking for, and in the world of Arras, being chosen to work the looms is everything a girl could want. It means privilege, eternal beauty, and being something other than a secretary. It also means the power to manipulate the very fabric of reality. But if controlling what people eat, where they live, and how many children they have is the price of having it all, Adelice isn’t interested. Not that her feelings matter, because she slipped and used her hidden talent for a moment. Now she has one hour to eat her mom’s overcooked pot roast. One hour to listen to her sister’s academy gossip and laugh at her dad’s jokes. One hour to pretend everything’s okay. And one hour to escape. Because tonight, they’ll come for her." 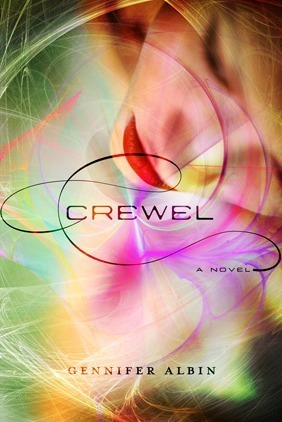 Crewel certainly isn't a hugely creative science fiction novel as the book claims; it has all the usual dystopian elements of an authoritative government controlling who you marry, where you live, etc., but it does have some interesting aspects, most notably the description, something most fast-paced YA novels don't have because the author thinks the reader will lose interest. Not so here. I mean, the first paragraph is description, and so is the second. And while the writing wasn't great, I do admire Albin for trying to add a bit more to the novel rather than just sheer suspense. The main part of the plot is somewhat unique, but it's not really explained until later on: the Spinsters who weave time and manipulate reality. That was quite interesting and it originally drew me into the novel. Adelice's parents don't like the system, and they've trained her, despite her talent, to hide it. But she slips up, and is taken away to be a Spinster, a position all the other girls covet. The rebounding process that Adelice has to go through in particular was quite unique. I'd never read anything quite like it, with the threads of time being woven so that people can effectively travel without moving a muscle. Of course, there is another typical part to the plot; Adelice is different from all the other Spinsters, more powerful and dangerous than they are. What I didn't understand was why Adelice slipped so easily. There may be some small part of her that wants to, yes, but she knows that once she is chosen, she can't ever see her family again, and that she certainly doesn't want. Besides, Adelice's parents have trained her for years to hide the talent that she has, to be "incapable, awkward, artless." It didn't seem plausible that in one instant, she could forget all of that. For much of the book the reader also doesn't know exactly what happened at the Testing, just that Adelice messed up. Later it's kind of explained. Parts of Crewel were definitely quite chilling, especially when Adelice first arrives at the compound, which is basically a web of illusions and fake windows.There’s also the fact that each person is represented by a thread, and these threads are altered and removed with mechanical precision. Calling people threads makes it sound less bad, and none of the other girls seem to question any of it. The compound sounded like an awful, awful place, where everyone looks perfect but is trapped forever to do the work of Arras and the Guild. Adelice also learns about the Creweler, the head organizer. She doesn't want to become one of these perfectly unsettling people, but she really doesn't have much of a choice. I found Adelice a little insensitive at times. For example, at the orientation, Adelice says, "I almost feel sorry that some of them have left everything they know and love behind to wind up as servants. Almost." This seemed a bit cruel to me, even if those girls did want to leave and are embracing their new lives. You'd think Adelice would have a bit more sympathy, especially since she loses her beloved family too. I didn’t love Crewel though, mainly because of the romance, which predictably was a love triangle. Please, can we cool it with those? Apparently not, because there is one, and I really disliked it. The world that Gennifer Albin created was interesting enough without romance; that whole element could have been taken out or at least less emphasized. I was expecting it, but it was still disappointing. I did enjoy the world and the story though. I suppose Crewel is worth reading, but it got kind of muddled in the later sections, and I'm glad I checked it out of the library.